The first two pics show the cherry cabinet. This cabinet doesn’t have any plywood or “engineered” wood in it. I think this may be a first for me! I also used my router plane to mortise in the hinges, and they turned out very well – another first. The last two pics are of a maple/birch bench. It’s so small I couldn’t use drawer slides, but the drawers open easily, and I applied some anti-friction tape to make it really easy for children to use. Pictures don’t show real well, but the top and sides are made from a nice piece of bird’s eye maple I’ve had sitting around for a long time. Both projects are for the Catechesis of the Good Shepherd classroom I mentioned in my previous project post. Kids have almost as much junk as woodworkers, so storage for them is amazing. I really like that cupboard, what are it’s dimensions? Calling it a “kids” piece would maybe eliminate someone from making this for a mud room, or other point where the entire family passes through, and drops off items used frequently, for whatever pursuit is timely based on season of the year. Based on comparative width of the dust collector behind it the yellow one looks to be big enough to be a toy box, but one that could eventually move with a kid through a college dorm to hold quite a bit of most anything. Nice job on both, and thanks for posting. A regular idea center that almost any family could draw from. Both are very nicely done. I am sure they will be used often. Kids have almost as much junk as woodworkers, so storage for them is amazing. I really like that cupboard, what are it s dimensions? Calling it a “kids” piece would maybe eliminate someone from making this for a mud room, or other point where the entire family passes through, and drops off items used frequently, for whatever pursuit is timely based on season of the year. 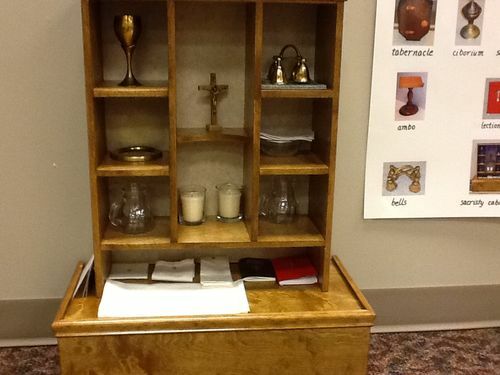 The cherry cabinet is a sacristy cabinet. 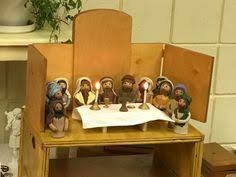 The other one is for setting a “diorama” of the last supper on. Jesus and the 12 disciples are stored in the drawers when not being used. Both are very small. The cherry cab is 26” tall, I think, and the bench is 11” tall. Good looking storage for the little ones, Pete. I thought that maybe the cabinet may of sat on top of the bench, Nice anyways! Stellar job on the build of the cabinets…..Very nice….I’m sure some young person will get many years of use from them….I like the cherry cabinet….If arranged differently, it could serve as a shop cabinet…..!! Thanks for posting…..!